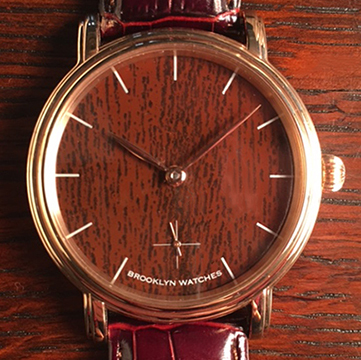 Brooklyn Watches are built by David Sokosh in Brooklyn and Claverack, New York. Most of the materials are gathered at Claverack (near Hudson, in Columbia County) and the movements are cleaned there. Assembly usually happens in Brooklyn. They are powered by vintage pocket watch movements, which are between 40 and 50 years old. The movements (model numbers 6497 and 6498) were manufactured by the Swiss watch company Unitas. Unitas was bought by Swatch in the late 1970’s. Another Swatch company, ETA, still makes movements with these model numbers. I prefer the vintage mechanisms. They offer a higher level of finish than the current product. These are mechanical 17 jewel, manual wind movements. They are fitted with an incabloc shock absorber for years of reliable service. Their power reserve is approximately 40 hours. These are available in a variety of textures and finishes. They are fine movements, but their accuracy cannot be compared to modern battery operated quartz movements. Expect your mechanical watch to run 10 or 20 seconds fast or slow in a day. They will get you to work on time and you won't be late for dinner dates, but if you are planning to launch a rocket for NASA, switch to a quartz watch that day! I seek out pocket watches, restore the movements, modify them slightly and set them in new wrist watch cases. Sometimes I use the vintage pocket watch dial as well, re-branding it Brooklyn Watches. These vintage dials will often show signs of use and a mark where the original brand was removed. Other models receive new dials, some that I have designed and produced myself. The cases are newly made and come from a variety of sources in the United States, Europe and Asia. Some may resemble famous watches, but they are an homage to those designs, and should not be confused with their honored predecessors. The cases are made of stainless steel, some with a PVD coating. These coatings are of good quality, but even the best coatings will eventually wear, revealing the stainless steel beneath. If this is a concern, choose a straight stainless steel case. The cases are water resistant. There is a rubber gasket in the back and in the crown. Feel free to wash your hands, sweat or get caught in the rain with one but don't wear a Brooklyn Watch in the shower, or pool. The leather straps are created in Italy. Collectors respond to my re-use of vintage materials in combination with new elements. I usually build one watch per week. Click on Watches in the menu above to view the pieces that are currently available. If you don’t see the perfect watch, check back soon, I update the site every time I build a new watch. Follow me on Facebook or Instagram for up-to-the minute news on new watches. These green machines require no batteries. They are manual wind, meaning that the wearer winds and sets the watch each day. This interaction makes telling time a much more personal experience. 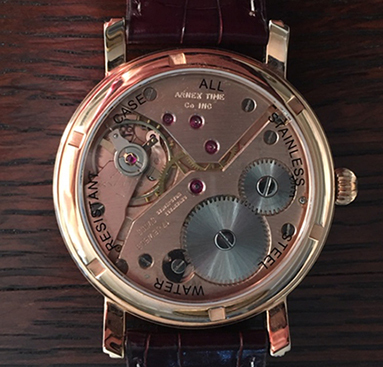 If a mechanical watch is used daily, it should be serviced every 2-3 years. I provide this service, or it can be done by any good watch repair person. Brooklyn Watches are guaranteed for one year from date of purchase (any damage to the watch crystal and damage to the case and movement from abuse is not covered by the guarantee). If you have a question or want to purchase a watch from this site, click on the Get This Watch! button in the listing. This should open an email and you can write to me. The prices quoted include shipping within the US via USPS Priority Mail, insured. The prices do not include sales tax, which must be collected for watches delivered (or sold) in New York State. Click an Icon in the menu below to find my latest posts on Facebook or Instagram. Remember, Brooklyn Watches are only available from this website. There are other companies with similar names out there. Look for my name, David Sokosh, and the Built in Brooklyn Since 2009 trademark to know you are dealing with Brooklyn Watches!